3rd June 2017 marked the 60th anniversary of the handover of pilot scheme D8000 from English Electrics Vulcan Foundary at Newton-le-Willows to British Railways. 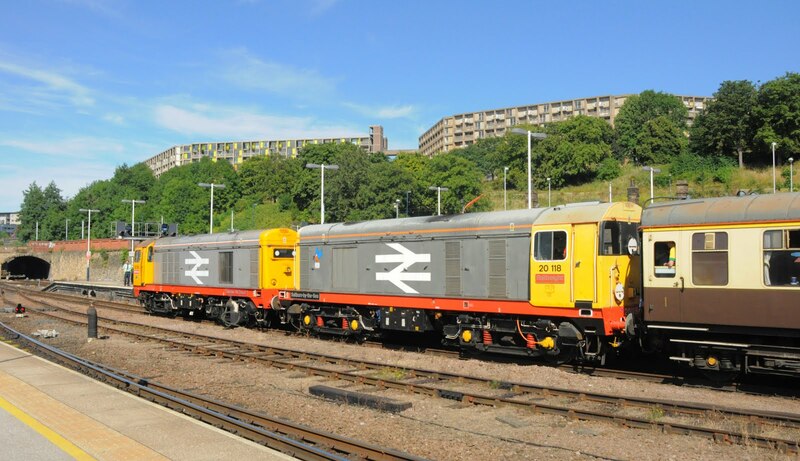 The first of 20 pilot scheme diesel locos which would lead to a successful production run totaling 228 engines had appeared on the rail network. The class 20's soon found their worth and were a familiar sight throughout the early diesel era, often working in pairs bonnet-to-bonnet providing a lightweight 2000hp power solution (and also removing the issue of the poor visability for the loco crew when driving 'bonnet first'. While withdrawal of the class by BR began in the mid 1980's some members of the class did make it through to the privatised era, most notably with DRS employing a fleet of up to 15 modified class 20/3's. In more recent years Harry Needle Railroad Company (HNRC) has returned several class 20's to the main line for hire contracts, including to GBRf for work delivering London Underground S-Stock train sets from Derby. On Sunday 16th July GBRf ran one of their occasional charity trips the 'Charitably Chibble' tour from Ipswich to Basingstoke (via Sheffield) employing a pair of HNRC class 20's for the section north of Peterbrough. GBRf turned out 20132 and 20118, the pair of Railfreight Red Stripe and undoubtedly the best looking locomotives of the class on the network today. As well as raising more than £21,000 for charity GBRf provided a great day out behind these locomotives of 60 year design vintage. While 20's were never common on passenger trains they certainly would have been regulars to the Sheffield area with many of the class being based at the large marshalling yard at Tinsley. 20132 and 20118 are here pictured at Sheffield station, overlooked by an icon of the Sheffield skyline the Park Hill estate, another product of 1957 when construction began. This modernist estate of 995 dwellings took influence from the work of French architect and urban planner Le Courbusier was initially popular but fell into decline in the 1980's and 90's. Controversially the estate was awarded Grade II listed status in 1988 becoming the largest listed building in Europe. Renovation of Park Hill began in 2009 and full completion of the scheme is expected in 2022.